Educators can now use Hubbard Brooks long-term data sets to teach inquiry in their classrooms. J. Wilson, Hubbard Brook Research Foundation Snapshot : One of the Northern Research Station's primary partnerships supporting environmental literacy is with the Hubbard Brook Research Foundation, which has the mission of promoting understanding and stewardship of ecosystems through scientific research, long-term monitoring and education. At the Forest Service's Hubbard Brook Experimental Forest in New Hampshire, the Northern Research Station and Northeastern Area, State and Private Forestry are lead partners with the non-governmental Hubbard Brook Research Foundation in statewide efforts to strengthen teachers' abilities to analyze and interpret real ecological data with their students. 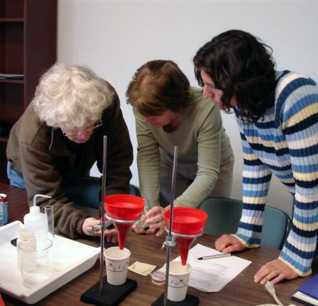 With partners from across the state, the Foundation's Environmental Literacy Program is creating innovative science inquiry programs for middle and high school educators using data sets and real life examples from the Hubbard Brook Experimental Forest. Partnerships with local schools help the program and its partners brainstorm,develop, and test new materials such as New England Common Assessment Practice (NECAP) exams to helps students understand the process of science, not just the results.